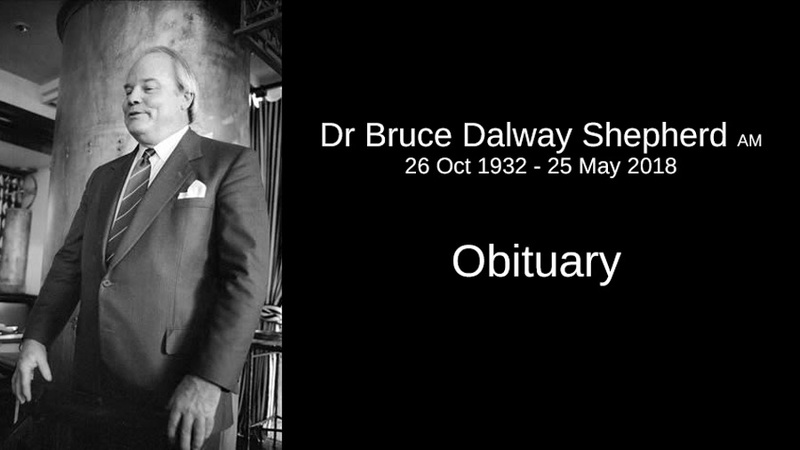 Bruce Dalway Shepherd was born at the height of the Great Depression on 26/10/1932 in the NSW country town of Tamworth. It was a difficult birth. His mother Mary (a former trainee nurse at the Coast Hospital in Sydney) would have died of post-partum haemorrhage had not her local, family doctor been able to save her. Bruce’s father, Albert, had left his father’s orchard at Baulkham Hills with his new wife to set up a spec home building business in Tamworth. Albert and Mary raised 8 children, Bruce was their third child and first son. Albert’s business interests widened with the acquisition of a local brickworks, agricultural land and stock market investments. Around 1968, he became the largest individual shareholder in BHP. Although a shy man, he publicly supported the rights of small shareholders, often in opposition to the BHP board, and was active in the Australian Shareholders Association. Growing up in Tamworth, Bruce attended the Dominican Convent School and then Christian Brothers, Mount Carmel, describing his teachers as “not being a very happy lot.” It didn’t stop him becoming dux of the school in the Leaving Certificate. Outside of school, Bruce did labouring work in the family brickworks, baled hay, played rugby league and swam competitively. The death of his older sister Patty, from measles and encephalitis in 1939, when Bruce was 7, left a sad mark on a busy but happy childhood. Bruce was 16 when he started studying dentistry at Sydney University. He graduated in 1952 aged 20, and since he was not old enough to be registered, he had to wait until his 21st birthday to receive his dental degree. He worked at the Sydney Dental Hospital before enrolling in medicine in 1953. His early surgical training was at Royal Prince Alfred Hospital, before heading to the UK with his new wife, Annette, to undertake orthopaedic surgical training under the late Ronny Furlong, Head of the Department of Orthopaedics at the prestigious St Thomas’ Hospital and the Rowley Bristow Hospital in Pyrford, Surrey, which was used by St Thomas’ as an outpost for surgical training. In the UK, Bruce became interested in the work of the late Dr Sir John Charnley with total joint arthroplasty. 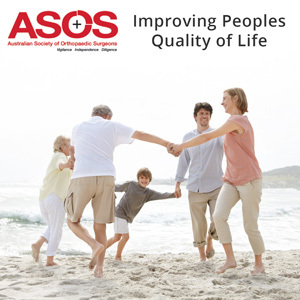 Back in Australia, he quickly established himself as an excellent practitioner in total joint arthroplasty. The late 60s was a time of significant technical advances in orthopaedics, with general surgery being nudged out of its traditional role as the paternalistic apex of surgical skill, although most orthopaedic surgeons at that time were trained in general surgery as well. Bruce set up rooms at Macquarie Street and obtained specialist HMO appointments at the Mater Hospital in Crows Nest (where he met his life-long colleague, anaesthetist Dr Jim Wilkinson), which was then a public teaching hospital and Eastern Suburbs Hospital as it then existed. As his reputation grew, he obtained HMO appointments at North Sydney Community, St George, Auburn and RPA Hospitals, with full appointments at Eastern Suburbs and St Joseph’s Hospitals, as well as doing locums. The discovery that his children Daniel and Penny were born profoundly deaf drove Bruce and his wife Annette into the field of education for the deaf. They refused to accept the barriers that prevented deaf children from developing their full potential, in education and vocation. This led to the founding of the Shepherd Centre and eventually a national hearing test of all babies to identify hearing impairment. It was a family project, with Annette, Daniel and Penny playing leading roles. In time, cochlear implants developed by Bruce’s friend, Prof Graeme Clark, would enhance the Shepherd Centre’s work. Bruce valued his time. He employed Anne Smith, an outstanding administrator, as his life-long practice manager. Together they structured his practice, utilising practice nurses to enhance his consulting productivity. With leadership and teamwork, he sometimes ran 3 operating theatres, efficiently utilising medical surgical assistants to help him manage big operating lists safely and productively. He freely taught others who visited his rooms and theatres how to be productive in their surgical work. He was much loved and admired by devoted hospital theatre nursing and ward staff as the dashing surgical achiever. He financed the overseas training of key theatre staff to ensure his work met international standards. His experience as a doctor in the UK left Bruce in no doubt that a completely nationalised health system was not the answer to maintaining high standards of medical care. He despised the needless bureaucracy, loss of productivity, and bed closures, which de-motivated the UK medical profession under the system Aneurin Bevan had created in 1948. Bruce saw no reason why it should be replaced with the importation of the blights of the UK system. He was not alone. In 1949, Robert Menzies and Dr Earl Page, with the support of Labor Prime Minister, Ben Chifley, successfully introduced an anti-conscription provision into the Australian Constitution to prevent nationalisation of the Australian medical profession. The events that led to the 1984 Doctor’s Dispute are well documented. On the 26th of May 1984, some 70 of the 270 NSW public hospital honoraries and VMOs resigned their public hospital appointments after failing to convince the Federal and State Governments not to proceed with their ambitious plans for a complete takeover of their public and private medical practice through a system of one-sided contracts. It was Bruce Shepherd who organised and led opposition to these coercive plans driven by the then Federal Minister for Health, Neil Blewett, and the then NSW Premier, Neville Wran. The dispute intensified, with Neville Wran threatening a seven-year ban on doctors (returning to the public hospital system) who had resigned. As John Harrison describes it, “Bruce’s leadership through this dispute was outstanding: against overwhelming odds, he personally stood up with many committed colleagues to Federal and State Governments, for principles that not only underpinned good medicine, but freedom itself. His actions came only after trying to warn an unhearing government of their folly in attempting to conscript doctors and the costly consequences of bureaucratic intervention and needless disruption to the then mix of honorary, public and charitable hospital care. i.e. the introduction of the blights of the UK system that Australia up until then, avoided.” These included a growing, costly and non-productive health bureaucracy, public hospital waiting lists and bed closures and most disturbingly declining productivity and morale of the medical and healthcare workforce. A significant outcome of the Doctor’s Dispute was that Bruce redirected his considerable energy and talent into the small NSW private hospital sector. He quickly set up orthopaedic registrar training in the 4 major hospitals to protect the registrars from ‘training unemployment’ due to the closure of metropolitan hospitals and the increased loads of trauma patients into the larger teaching hospitals. 75% of all orthopaedic work is now done in Australia’s expanded private hospital system, where orthopaedic trainees can now be taught the complete scope of orthopaedic specialty work thanks to Bruce’s foresight and leadership. Australia’s unique model of public and private hospitals, and the ability of doctors to work in both, owes much to Bruce Shepherd’s worked example of how it could be achieved. He loved productivity, efficiency, teamwork, co-operation and high achievement. He detested needless bureaucracy, coercion, waste and poor morale. The loss of his wife Annette to a debilitating series of strokes was a bitter blow to Bruce’s family and his professional life. Annette had been a key driver of the Shepherd Centre utilising her real estate investment skills to expand its services into western Sydney and beyond. As was often the case in Bruce’s life, his grief turned quickly to resolve, and he pressed on harder on all fronts. He confronted adversity with well thought-out actions. It was never, what can’t I do? Rather, what can I do and how can I get support to do it? The Dispute drove him to reform the then establishment AMA. He was the original outsider, organising with colleagues to take over the NSW branch and convert it into a more effective, proactive and responsive medico-political organisation. This soon led to his campaign to become Federal President of the AMA, which he achieved by overcoming institutional resistance to his leadership through strong support of his colleagues and in particular Dr Brendan Nelson, who was to go on and play a leading role in Australian public life. Bruce and Brendan became a formidable team, inseparable until Bruce’s passing. Under Bruce’s leadership, the Federal AMA acquired a new head office in Canberra although Bruce became concerned that it would become too close to government. “Just don’t catch the disease,” he warned. He also set about establishing a series of flat, rapid response groups, including the Australian Doctors’ Fund, Australian Society of Orthopaedic Surgeons, Council of Procedural Specialists and a collection of medical colleges including the The Australian Academy of Medicine & Surgery, just in case the government decided to nationalise medical training. He served as President of the Australian Orthopaedic Association and was a Councillor on the RACS although he often lamented the bulging meeting papers regularly filled with government proposals. With the help of his second wife Jenny, Bruce continued active participation in fundraising for the Shepherd Centre. He also managed to write his biography, Memories of an interfering man. The onset of cardiomyopathy and Parkinson’s Disease saw Bruce withdraw from medical practice, albeit many of his old patients were by now personal lifelong friends and would often seek his advice on their visits to his dream property (Dalway) at Horderns Road, Bowral, where he spent most of his latter years. Bruce responded to the challenge of his disability by ensuring that he maximised his exercise and daily routine to incorporate social functions and family gatherings. His remarkable achievements for his profession, deaf children and the cause of personal liberty would not have been possible without the support of his family, friends, colleagues and advisers. His friends crossed the political and social spectrum. He enjoyed fellowship with professors of medicine and bricklayers. Young and old admired and loved him. Bruce Shepherd was a realist. He understood his imperfections. He made mistakes, he had regrets but he didn’t dwell on them often stating, “at times we all have to get a bit of egg on our face” and, “live every day as if you’re going to live forever”. Few Australians can match his remarkable contribution. Few leaders attract such strong support. He was not afraid of constructive conflict and believed that left unchecked, power corrupts. His passing has caused a deep reflection on an era that built much of what we enjoy today. How will his legacy continue? This chapter is yet to be written. Regardless, he will be sadly missed. Among the condolences from his orthopaedic colleagues are comments such as: ‘sad passing but a mighty life’, ‘what a contribution’, ‘larger than life – a wonderful man’, ‘may the great man rest in peace’, ‘huge contribution’, ‘a giant of orthopaedic circles’, ‘he put his patients before bureaucracy’, ‘a beautiful friendship’, ‘always a few steps ahead’, ‘we don’t know just how lucky we have all been’, ‘a truly outstanding Australian’, ‘what an inspiration’, ‘none have fought more fiercely, we remain greatly in his debt’. Rest in Peace Bruce – forever free. This obituary was prepared by Dr John Harrison & Stephen Milgate at the request of the Australian Orthopaedic Association. The National Association of Practising Psychiatrists (NAPP) is dedicated to the maintenance of quality mental health care for all, and has a proud history of advocating for sensible policy formation.